My first child was born, along with all the other spring flowers, in April. Her birthday is always at the height of nature’s beauty. 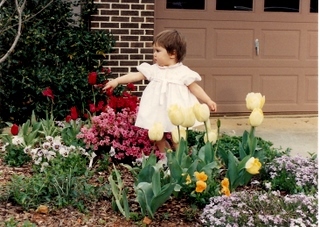 I adore the photo of her as a curious toddler reaching for tulips. Some mothers write poems or letters to their babies for them to read when they are grown. (Fathers can do this, too!) Writing down sweet memories of your child’s baby days is a precious gift to them. My baby turns 21 next week, but oh, I remember when she was little. More treasure to me than any pearl. I never wanted to set her free. To let their children fly or fall. And wait for a chance to hug again. This entry was posted in letters, poems, writing prompt. Bookmark the permalink.